In the Pink with Avon Romance - Lyons, Witches, and Curses, Oh My! - See a pig on the way to your wedding. - Take pigs on fishing boats. - Cross two knifes on a table. - Have a rowan tree outside your house to keep witches away.- Touch iron if you see or even hear evil. - Wear a sprig of white heather. - do not take home any pieces of lava; you are taking a part of Pele away from her beloved Hawaii. 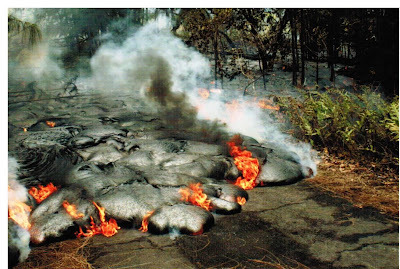 It is illegal do so from the perspective that lava is a limited resource and it may contain bugs that could contaminate your area. - do not carry pork over the Pali Highway. The Pali divides Oahu into windward, where Pele visits, and leeward, where she banished her spurned lover, a man-pig. Hence, bringing pork from the leeward to windward violates her edict. In 1909, work to build a drydock began over caves Hawaiians believed were home to a shark goddess. The drydock was nearly finished when it collapsed. Workmen clearing debris found the skeleton of a large shark in the foundation, after which Hawaiians advised that a kahuna priest cleanse the area with prayers and ritual offerings. After this was done, there were no further problems with the project. When Madame Pele threatened the town of Hilo with a voracious lava flow in 1881, the people asked Ke‘elikōlani to intercede [she was the granddaugher of King Kamehameha I]. Ke‘elikōlani offered traditional oli (chants) and ho‘okupu (tribute) to Pele and later reportedly camped at the foot of the flow. The flow stopped just short of town. Madame Pele devours all in her path. 1. Leave a comment about superstitions from your part of the world. - Ramblings From This Chick at this link. - Romantic Crush Junkies at this link. - The Reading Reviewer at this link. - The Romance Dish at this link. Book 1, LYON’S BRIDE, introduces us to the Chattan Family in the Regency Era - Neal, Harry, and Margaret. Neal, Lord Lyon, wants children, so he seeks a bride he cannot love. He falls in love with his matchmaker and falls ill from the curse. Inspired by his brother's love, Harry sets out to save his brother in Book 2, THE SCOTTISH WITCH. Maxwell provides readers new to the series with another prologue (different from LYON'S BRIDE) to join Harry in his desperate mission. He travels to Scotland to search for a witch to reverse the curse, leading him to Portia Maclean. Like Harry, Portia has Scottish blood but lived in England. Like Harry, she came to Scotland to save her family. Like Harry, she feels romantic love has no room in her heart. When they first meet, with Portia in disguise as a witch, they feel a mutual bond. In their second meeting, at the Christmas assembly, they feel a mutual attraction. As they engage in a passionate affair, they inadvertently open their hearts to the other … but also to the curse. They feel Finella’s wrath surrounding them .... but they find an unexpected ally. Maxwell steps outside the Regency Ballroom with the “paranormal elements” akin to Shakespeare’s MacBeth. 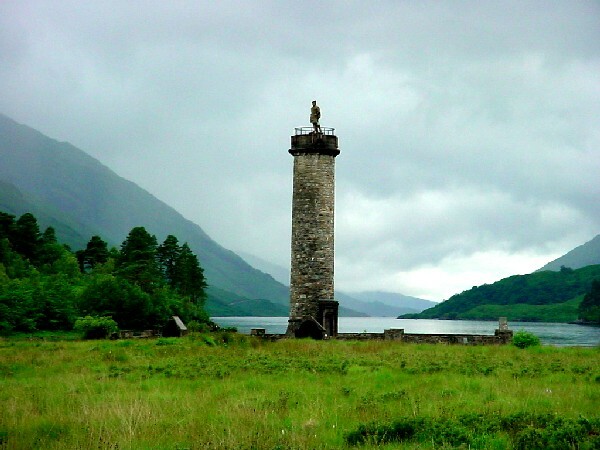 I applaud her for setting THE SCOTTISH WITCH in Glenfinnan – oh, the symbolism! 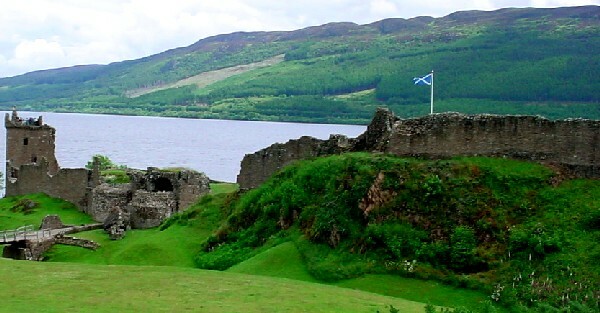 Glenfinnan is where Bonnie Prince Charlie returned to Scotland to reclaim the throne ... and Glenfinnan is where Colonel Harry Chattan returns to his ancestor’s crime to reclaim his brother's life. The Glenfinnan Viaduct delivered Harry Potter aboard Hogwart’s Express to his destiny … and Glenfinnan delivers Harry to his destiny with Portia. I have walked through Glenfinnan, traveled over the viaduct, and scoured the Highlands in search of crumbling castles – Maxwell’s storytelling took me back to this beloved vacation. Maxwell is known for her heartfelt characters and she delivers in THE SCOTTISH WITCH. Readers will sympathize with sweet sisters Portia and Minera; hiss at the selfish gentry Lady Maclean and Lady Emma; and cheer for the hapless dog loving General. Harry is the pièce de résistance with his transformation from the alcoholic womanizer to the desperate brother begging for Neal’s life – a scene that I will never forget. Or as a lovestuck rogue bursting through the church door to ... oh, you have to read the book yourself. I also applaud Maxwell for subtly addressing social issues of addiction, loneliness, and post traumatic stress of war weary veterans. Thank you, Cathy, for reminding us that love is everlasting! I received a print copy of THE SCOTTISH WITCH from Avon for this review. When I posted my review on Goodreads (at this link), I noticed LSUReader rated it with four stars. I invited LSUReader to join me in a "dueling" review. Today, I answer her questions ... and later this week, she'll answer mine! LSUReader: Forgiveness is a central theme in the book. At times, I doubted the characters could fully be redeemed. How did you view the prevalence of so much painful distrust and deception by so many characters? Kim: The book blurb references two surprises for Pierce at the Dowager House. There was at least another ... and the days spent with those three surprises lead to a fourth. I am being vague to not spoil the story for other readers. As you noted, forgiveness is the theme, so there has to be a conflict. Sabrina tapped into the "norms" of the Regency era and the customs of titled families to create that conflict - fear of scandal, security, and reputation - that rocked the three central characters. Sabrina excelled at drawing me into that fear while still making it a lighthearted, even heartfelt, story set during the holiday season. Pierce's estate lies in Herefordshire. LSUReader: Hero Pierce Waverly was introduced in Sabrina's Hellions of Halstead Hall series, and several of those characters briefly appear in TTNAC. If you read that series, how did your earlier "acquaintance" with Pierce influence your view of him here? If this was your first introduction to him, does it encourage you to read the earlier series? Kim: Pierce appears in 2 of the five books in the Hellions of Hallstead Series. I read the other three, so I was not familiar with Pierce. He could have been the garden variety Regency rake in those two books, but he is not in 'TWAS THE NIGHT AFTER CHRISTMAS. Pierce could spend days on Freud's couch, analyzing why he pursues the image of carefree womanizer when he is, privately, a thoughtful man who indulges in the pinafore. Pierce does inspire me to read the two books I missed from the series - I'd like to see him "in action" as the roving rogue. LSUReader: It was nice to see so many supporting characters fully fleshed out--the staff of the dowager house, estate manager Mr. Fowler, Mr. Manton the investigator--who was your favorite among them and why? Kim: Sabrina takes on the mantle that it takes a village, a country village, to tell a story, especially one of forgiveness. Supporting characters add dimension to the circumstances and keep the hero/heroine honest of their feelings. I chuckled at the "competition" between the staff of the dowager house and Pierce's household; it reminded me of Upstairs/Downstairs and even Downton Abbey. Mr. Manton was a surprising warm character in the last quarter of the book, especially in light of his connection to Pierce's youth. But I was cheering for Mr. Fowler to be appreciated by Piece and noticed by .... I won't tell. You have to read the book! Mr. Fowler was a dedicated employee who did not judge Pierce or his mother. He was honest and forthright with the staff, including Camilla. In the end, he wasn't as stern as the dowager's staff thought he was. 1. Leave a comment holiday shopping - do you prefer Christmas fairs, shopping malls, or catalogues? Make sure you visit Sabrina's website, sabrinajeffries.com, for fun tidbits! "Harry" is considered the father of the English Navy, which would rule the seas for four more centuries. His obsession with fathering a male heir lead to England's separation from the Catholic Church and fueled the Protestant Reformation across Europe. He eclipsed his dead brother in promoting England as a European power and a center of culture. Having served as a captain in the Field Artillery during WWI, Harry knew the cost of war. His presidency saw four major actions to promote peace: the creation of the United Nations; the atomic bombing of Japan; the creation of NATO; and the UN's collective response to the Korean crisis. Harry emerged from Roosevelt's legacy to establish his own. hosted the Japanese surrendered to end WWII. Prince Harry joined the Household Cavalry, and served in Afghanistan for more than two months from the end of 2007 to early 2008. He is now training to be a helicopter pilot with the Army Air Corps. 1. Leave a comment about your favorite Harry - any of the above? Or another Harry? 3. Comments are open through Saturday, October 27, 10 pm in Hawaii. I'll post the winner on Sunday, October 29. Come back on Wednesday, October 31, to celebrate the release of THE SCOTTISH WITCH with a special giveaway! To learn more about the Mighty Mo, check out my photos on my travel blog, ALOHA ON MY MIND, at this link, link, link, and link. Two brothers .... Harry and William? Colonel Chattan and Lord Lyon?